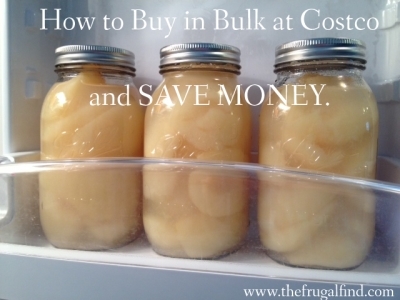 The Frugal Find has a great post on saving money by buying bulk canned foods at Costco. I do this too, and can vouch for the savings. The idea is that instead of buying individual-sized servings, like 4 ounce fruit cups, you buy a giant 106 ounce can of the fruit for much cheaper and divide into freezer-safe containers for when you’re ready to use them. For example, a can of pears costs $4.59 for 106 ounces, or $.04/oz. The fruit cups cost $.50 per 4-ounce-portion, or $.12.5 /oz. Buying the large can of pears costs 75% less, and all you have to do is spend 5 minutes dividing the pears up into smaller portions. I’ve been doing this with beans lately, and estimate they are even cheaper than buying dried beans and cooking them myself. Tomatoes are a good deal too, although not as good as planting your own, of course. So when u divide the pears for example are you putting them in tupperware dishes?? What do u use? Janelle, yes, or some other freezer-safe container. Topperware works great.